A resource center for lesbian, gay, bisexual, transgender, queer people, and their allies, held its grand opening in Billings this weekend. At least 50 people gathered in a bright and colorful room inside the Billings First Congregational Church downtown. It’s the site of nonprofit 406 Pride’s new resource center, a future hangout and safe space for LGBTQ people in the Billings area. 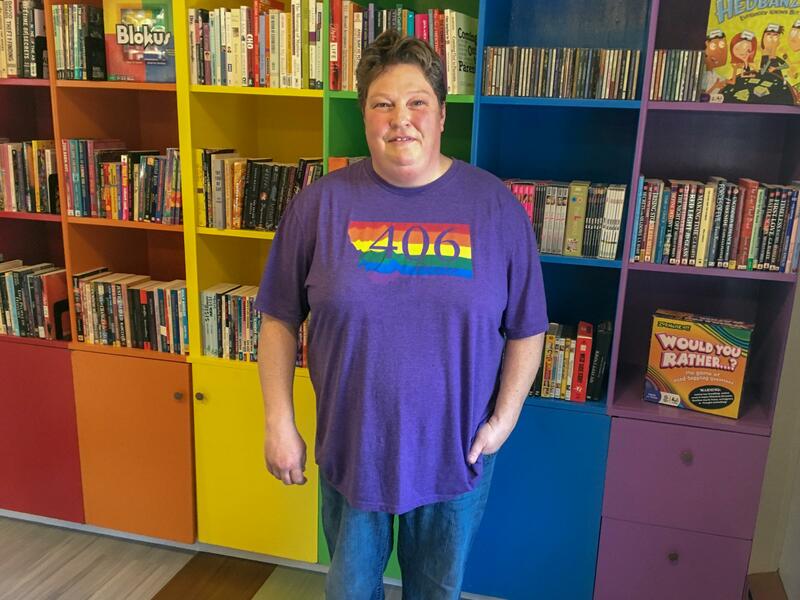 406 Pride started the grant-writing and fundraising process last year, and much of the interior is hand-made, from the rainbow-painted bookcase to the large wood and metal table near it. At the grand opening Saturday afternoon, Pastor Lisa Harmon with Billings First Congregational Church was one of those to stand in front of the crowd and give a blessing. “Today, we say that this rainbow of sexuality and gender is a gift to this church, to Billings, Montana, this rocky mountain region, and to the world,” said Harmon. 406 Pride president, Shauna Goubeaux, said they chose this particular space partly because it’s centrally located and partly because it has a separate bathroom and entrance independent of the church. She acknowledges that the relationship between churches and the LGBTQ community hasn’t always been an easy one. Goubeaux looks back at a time when she could have used the support a resource center like this one could have provided. Six years ago, she and her wife were trying to adopt and faced resistance from church-run adoption agencies, which she says at the time were the only options in Billings. Goubeaux says while gay rights and activism is still highly political, the resource center is not intended as a political space. Every identity, and everyone, is welcome, and Goubeau says it’s about making LGBTQ people feel seen. Jace Dyckman is with Southeast Montana Prime Timers, a group for older gay men. He says while he has felt welcomed in the coffee shops and other venues where the group meets, he looks forward to having an established space. He says he’d also like to better connect with other members of the LGBTQ community, including younger gay people who may feel isolated and alone. According to the Montana Department of Public Health & Human Services, LGBTQ youth are four times more likely to attempt suicide than heterosexual youth, and last year Montana was found to have the highest suicide rate in the country. 406 Pride has a number of events coming up in their new space, including game nights, movie nights, and a youth prom. Edit 3/26: A former version of this article mispelled the name of 406 Pride's president, Shauna Goubeaux, and the spelling has since been corrected. People filled the room to capacity, and then some, at a 90s Drag Show this weekend in Billings. A nonprofit drag group, the Countship of the Imperial Soverign Court of the State of Montana, organized the event. The Countship is part of a larger international organization and has chapters in different cities around the state. The event this weekend could be a taste of what’s to come. Earlier this month, Billings Public Schools implemented a new filter system that blocks websites based on a list of keywords. A few days later, CounterPunch magazine reported that students were also unable to access certain websites addressing pro-LGBTQ issues. Twelfth-grader Clara Bentler, a student leader at Billings Senior High School, says a teacher showed her the list of blocked keywords and key phrases.